Here we have transiting Saturn (blockage, restriction) in Russia's Fourth House (nourishment, etc.) 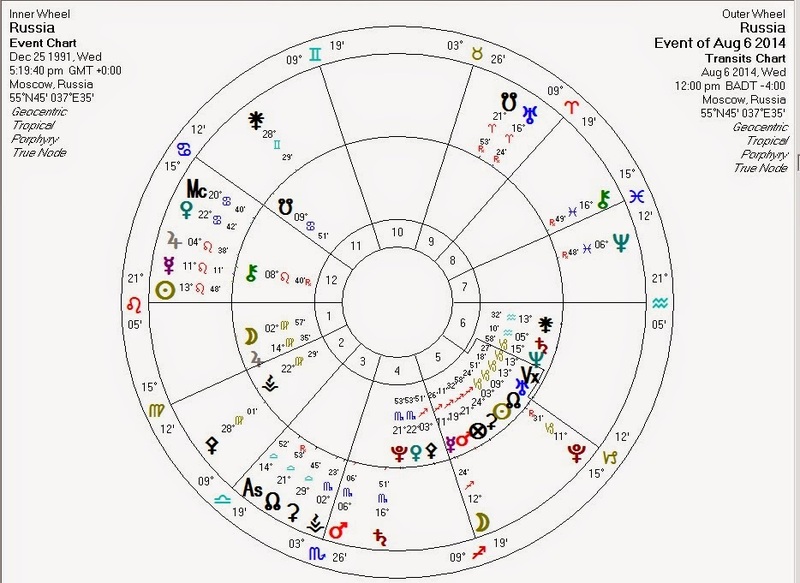 approaching a conjunction with Russia's Pluto (ruler of said Fourth House). Transiting Saturn is also at the midpoint of Russia's Jupiter and Neptune, with Jupiter and Neptune both representing foreign elements. Chiron (wounding/adjustment) is hovering at the cusp of Russia's Eighth House (other people's resources). Alas, Putin, for all his admirable restraint, isn't perfect. Those of us who understand the free market understand that any restrictions on voluntary trade harms all parties involved more or less equally.